A source familiar with the situation said that Deripaska did not want to remain as a minority shareholder in Nornickel if Abramovich were to sell his stake, leaving Deripaska one-on-one with Potanin. Dmitry Rybolovlev's windfall came in 2010 according to Forbes when he sold his stake in Uralkali for $6.5 billion. Today he is worth $9 billion placing him 100th in the world and the lucky 13th richest man in Russia. Another one of Russia's privatization billionaires he first worked for his fathers medical device company in 1990 before setting up an investment firm, Perm, just in time for the great Yeltsin industrial asset sale bonanza. Rybolovlev, 45, built up a controlling stake in Uralkali over the following years and in 2007 listed the company in London. Last year Uralkali merged with Silvinit and the combined operations' capacity is more than 10 million tonnes per annum, placing it behind Potashcorp of Saskatchewan. Rybolovlev's ascent top echelons was far from smooth – in 1996 he spent almost a year in Russia's toughest prison awaiting trail after being accused of a plot to kill a business partner. Forbes reports Rybolovlev "is best known in the U.S. for his real estate moves. He bought Donald Trump's Palm Beach mansion, Maison de L'Amitie, for $95 million in 2008. He paid $88 million for a Manhattan apartment former Citi chairman Sandy Weill listed, buying the pad for his daughter Ekaterina Rybolovleva, 22; the sale set a new record on price paid per sq. foot. He also apparently paid more than $300 million for La Belle Epoque penthouse in Monaco, where he lives." Deripaska's net worth is pegged at $8.8 billion by Forbes and the 44-year old comes in at no. 104 on the list of the world's billionaires. Proving what a rich hunting ground Moscow had been over the past two decades he only ranks 14th in Russia. 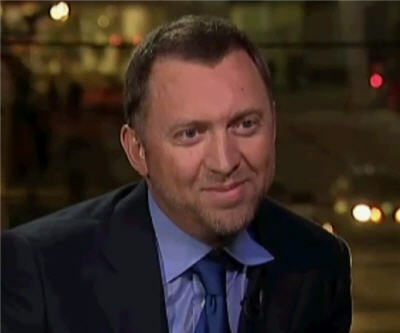 After making most of his money through aluminum giant Rusal, Deripaska (pictured in a 2011 CNN interview) is now the major shareholder in Norilsk Nickel after buying Mikhail Prokhorov's stake after the latter fell out with erstwhile business partner Vladimir Potanin. The Russian metals world is definitely one of wheels within wheels. Just like the feud between Abramovich and Berezovsky now being played out in London's courts, the bitter rivalry between Deripeska and fellow billionaire Viktor Vekselberg is threatening to become very public. Vekselberg is threatening to sue Deripeska after quitting as Rusal chairman over Deripeska's ambition to create an integrated metal and mining business by merging Rusal and Norilsk. Like other Russian billionaires tied to Norilsk, Deripeska has seen his wealth being whittled away by the stumbling metals giant. He was worth as much as $28 billion in 2008. Forbes reports he "came back from the brink during the financial crisis: facing margin calls and billions of dollars in debt, he personally negotiated with the Russian government, banks and other creditors to restructure loan obligations. Deripaska managed to defend the majority of his assets from creditors, including car maker Gaz, energy sector EuroSibEnergo, and Glavstroy construction projects. The debt of his holding company Basic Element is still huge, about $21 billion." Iskander Makhmudov's wealth comes in at $8.2 billion which today is mainly held in his majority-owned Ural Mining and Metallurgical Co, one of Russia's biggest copper producers with some construction and agriculture businesses thrown into the mix. The company's roots go back hundreds of years and the original Ural deposit in the late 1800s supplied 25% of the world's copper. It's new flaghsip Safyanovskoye underground mine will go into production next year. Apart from the gamut of copper products UMMC also mines zinc and iron ore and produces steel. The Bukhara-born Uzbek is fluent in English and Arabian and after leaving Tashkent University where he read Oriental studies, the 48-year old worked for the USSR Ministry of Foreign Affairs in Libya, Iraq. He is Russia's 16th wealthiest individual and umber 110 in the world according to Forbes' estimates. Forbes reports his "first moves as a businessman were with the Chernoy brothers, the Reuben brothers and their Trans-World Group, once the largest metals-trading operation in Russia. Last autumn, Spanish authorities named him in a money laundering case, which they handed over to the Russian Attorney General's Office for further investigation."